Many cultures revere animals as royal, sacred beings whose importance in nature and the cycle of life surpasses that of humans. They are mediators between the visible world and the invisible world. They give a voice to what is seemingly incomprehensible. This is certainly true of the Baga peoples who created the mask shown here. Banda is a spirit messenger who appears in times of crisis. 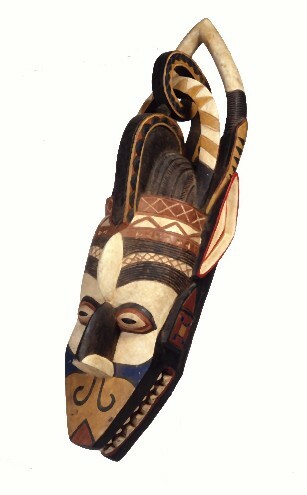 Banda's head portrays a fusion of the features of a crocodile, an antelope, a chameleon, and a snake. While a drummer plays giant wooden slit gongs, a boy wearing the mask transforms himself into Banda. The mask rests on his forehead. Bleached raffia covers his face and body. His pants are edged at the ankles with raffia fringe. The slit gongs continue to play as the dancer sweeps up great clouds of dust while his body imitates various animals such as a bull, bird, serpent, or fish. Great calamities are foretold by Banda and then turned aside from the community by the participation of the on-lookers. Bibliography:Hahner-Herzog, 1998, p.25; Lamp, 1996, pp.146-148.